Recipe from Clara Aquilar, Spanish Card Marketing, American Greetings. 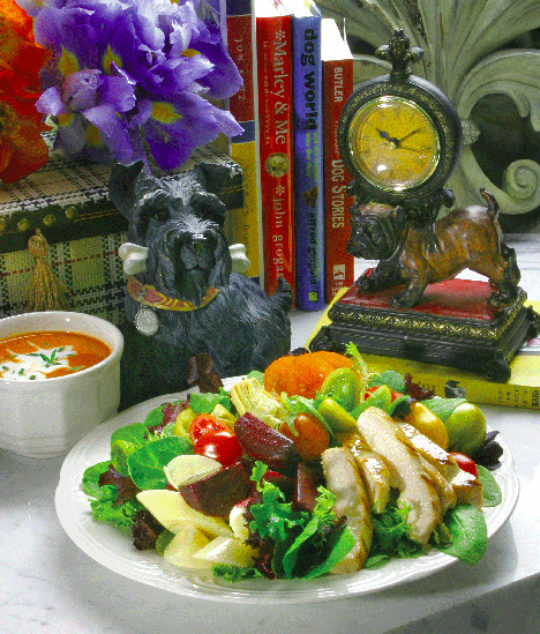 Cool off during the dog days of summer with this refreshing California Salad. Add our super soup, made with red peppers and tomatoes, as another tasty treat. This recipe will make you sit up and beg for more! Marinate chicken breast in olive oil, lemon juice, garlic clove, salt and pepper. Marinate 2-4 hours. Grill chicken until the juices run clear. Arrange greens into individual dishes, divided into 1 cup greens per person. Arrange artichoke hearts, hearts of palm, tomatoes and beets. Mix all ingredients together and shake well before serving. This recipe makes 4 servings.